Last years Interstellar was one of the two space films we have rarely seen in sometime the other was Gravity the year before. It was a film that was deep in emotions and the stakes were high as hell. It was long filled with more than the needed amount of intelligence and not a go back re watch film but still an experience upon viewing. Now in 2015 we get yet another space film but this switches the flow up a bit. The Martian, which is directed by the beloved Ridley Scott, brings a different tone here and we get a different kind of story. Matt Damon takes center stage among a big ensemble cast that does it’s job well here. 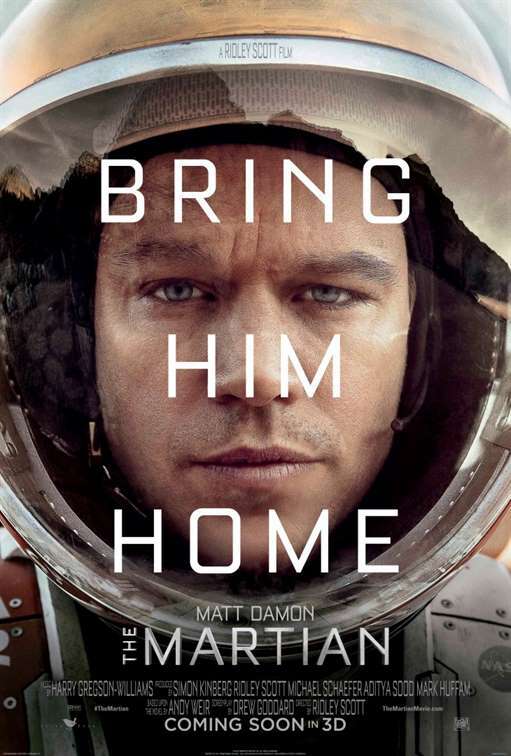 Mark Watney played by Matt Damon, is a member of a crew of astronauts whom we see has been on Mars for 21 sols. A storm comes through on the planet and they are forced to abort the mission Debree flees everywhere and Watney gets hit by one and is presumed dead. However Watney actually survived and is forced to use every means necessary and use his intelligence as a botanist to stay alive long enough for 4 years as he tries to make contact with NASA and his crew to bring him home. The Martian is an absolutely great picture. Not surprised at all it is at the top of the box office right now.